White and pale pastels are the colours associated with Neo-classical styles. 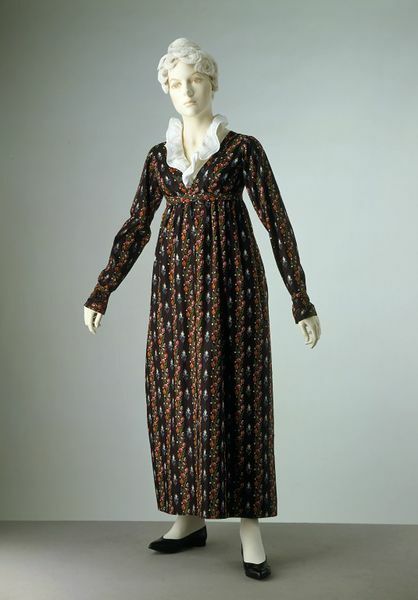 Gowns like this one and others in the collection show, however, that darker shades were also worn. This printed cotton has a black ground with pink and green flowers. It would have been appropriate for informal winter wear. The hemline at the ankle is characteristic for this period. 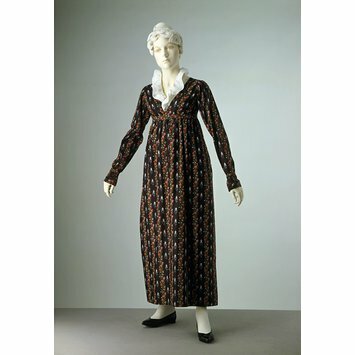 The use of darts in shaping the bodice of the gown was a new development in dressmaking. Day dress of block-printed cotton. With a black ground printed with a vertical stripe of pink and green flowers interspaced with white diamond motifs. The dress has a high-waisted bodice, with bust darts and a deep pointed neckline which wraps across at the waist, and is trimmed with a faced border. The skirt is straight cut with side plackets and ties at the waist. It is arranged in narrow pleats at the back. The sleeves are knuckle-length, with faced wristbands. There is a matching belt attached at the back and an inner waist tape. The hem is faced with brown glazed cotton. The material dates from the 1790s but there is no sign that it has been re-used.